Bolt-On rake kit, and now the Slip Fit Wedge weld in kit.2009-2013 HD Touring. American Suspension - The Choice of Champions Since 1997 – . They have done it again - we designed the slip fit short neck kit, then the innovative and patented Bolt-On rake kit, and now the Slip Fit Wedge weld in kit.
. The Slip Fit Wedge kit will allow you to make one cut to install our solid billet steel Wedge, then reinstall your stock neck, weld up and your ready to install the raked trees. 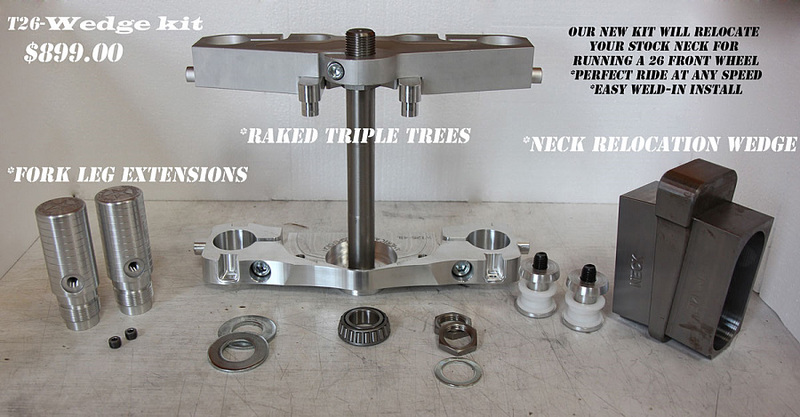 This kit is for the customer that wants a cost effective option to moving their stock neck for running the big wheels. .
At only 9 Retail it is sure to be another hit from American Suspension.. The T26 Wedge is available now! 2009-2013 HD Touring..